An open talk about Artist in Residencies was held in the form of a skype session between Youkobo Art Space, Sa Sa Projects (SSAP) which was established inside White Building housing estate in Pnom Penh in Cambodia, and one of its founding members Lyno who is currently based in New York. 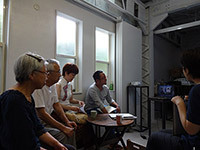 Youkobo staff member Emma Ota is currently in residence at SSAP to conduct research, and also joined the discussion to offer her thoughts on site. A livley exchange of opinions took place between the young artists and founders of the still young SSAP organization, and their strong spirit which is helping to lift the community could really be felt in art activities including children's workshops and public art events which are taking place in an environment by no means favorable to such activities. The result was a truly meaningful "open discussion".